Anne Rowlands is correct, they are fall webworms, not gypsy moths (gypsy moths don’t form webs). And though they are unsightly, they will not defoliate your tree; in fact, they rarely cause damage to trees. Additionally, they are food for birds. If you don’t like the sight, snip out the nests — it’s nature. Fall webworms are more prevalent this year due to optimum weather conditions. On the other hand, the weather condition have been very bad for gypsy moths. The wet weather has activated the maimaiga fungus, which kills gypsy moths — and the reason we don’t see many, if any, this year. Alert — and aggravated — “06880” reader Sandra Urist says it has been at least 39 years since we’ve had gyspy moths in Westport. According to the US Forest Service, the gypsy moth is one of North America’s most devastating forest pests. The species originally evolved in Europe and Asia thousands of years ago, and was accidentally introduced near Boston around 1868. In 1890 state and federal governments attempted to eradicate the gypsy moth. They failed, and the range spread. 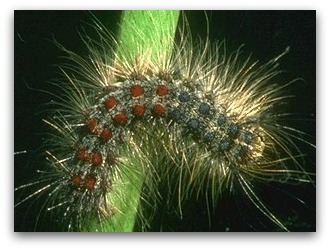 Gypsy moths feed on on the foliage of hundreds of species of plants in North America. The most common hosts are oaks and aspen. When densities reach very high levels, trees may become completely defoliated. Several successive years of defoliation may result in tree mortality. Have you noticed gypsy moths? How do you handle infestations? And, Sandra wonders, how we can manage the gypsy moth problem organically, without using pesticides that kill beneficial pollinators? This entry was posted in Environment and tagged Gypsy moth. Bookmark the permalink. I have a lacebark elm. Noticed 2 branches with nests. Am just over the line into Southport. Be aware! Those are fall webworms, not gypsy moths. They are a pain but nowhere near as devastating as gypsy moths, which have done their damage for 2018 in the eastern part of the state. Have had 6 different incidents on different trees at Regent’s Park. Cut down the branches and all evidence of the moths. No observations lately. I did not grow up in Westport but I did grow up in Connecticut. I remember the gypsey moths, 1000s would be on a tree. It was gross. Anne Rowlands is correct, they are Fall Webworms, not Gypsy Moths (Gypsy Moths don’t form webs)…and though they are unsightly, they will not defoliate your tree, in fact they rarely cause damage to trees. Additionally, and they are food for birds….. If you don’t like the sight, snip out the nests…..it’s nature. Fall webworms are more prevalent this year due to optimum weather conditions…..on the other hand, the weather condition have been very bad for Gypsy Moths. The wet weather has activated the maimaiga fungus, which kills Gypsy Moths….and the reason we don’t see many, if any this year. Unsightly? How rude and judgemental! I imagine for a common house wren they are quite lovely, and delicious. I meant unsightly to the Tent Caterpillar, which looks down on the webbing of the Fall Webworm…. They’re just jealous, because webworms don’t have to leave their homes to eat. No doubt they are jealous, but not as jealous as the Webworm is of the Bagworm and their mobile silk casing…. and who could blame them? We grew up seeing their nests, and the forests seemed to do fine, so I haven’t touched the nest that’s in our Lilac tree. Good to know they might not even be gypsy moths or harmful to the tree itself – thank you. We moved to Westport the autumn after the Gypsy Moth infestation was over. The following summer and several summers after that there were no fireflies. I ‘ve always suspected that it was because of spraying. Remember those recent reports about bee hive collapse? Something very important to remember: “Chemical control should be used only after all other methods have failed.” (from the Ladybug UConn site Anne Rowlands recommended above). Thanks for the correct info. Having witnessed the tent caterpillar infesation of the 70’s, or was it 60’s? I was very concerned about my lovely elm. We cut out branches in several different trees where webs existed, put them in our fire ring and burned them (no noxious spray). We live in Greens Farms and so far haven’t seen any new webs although we are constantly on the lookout.. Try Thuricide, an organic Bacillus thuringensis. Applied as a topical spray, it is ingested by caterpillars. As the vegetative master is digested, the bacteria excretes a sharp crystal which pierces the “gut” resulting in a sepsis which is fatal. Gypsy Moth usually appear in May and June.